Edmund "Jerry" Brown Jr., Attorney General and former two-term Governor of California (1975-83), will be the featured speaker at a public talk hosted by the School of Social Sciences' Center for the Study of Democracy. 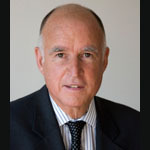 Brown will discuss his more than 40-year career in politics and address questions regarding the future of the state of California. For a full length biography on Attorney General Brown, please visit http://ag.ca.gov/ag/brown.php. This lecture is free and open to the public. Seating is on a first come, first served basis. Public parking is available for $8 in the Student Center Parking Structure located directly across from the Student Center. For further questions, please contact Sheila Hayden, 949-824-2904. For more information on the Center for the Study of Democracy, please visit http://www.democ.uci.edu/.